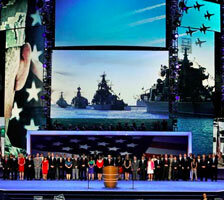 Drudge posted a well substantiated story (and here) about the backdrop images used to “honor” our veterans on the last night of the Democratic convention. It was an image of four Russian Federation ships that are part of their Black Sea Fleet. It also contained seven American F-5 trainer jets that appear to have been Photoshopped into the erroneous image. 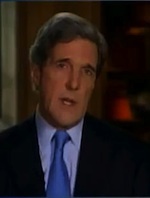 The image was a backdrop for both Adm. Nathman and John Kerry. In the case of Kerry, it made me laugh out loud. Either the use of these images was deliberate or an act of incompetence. I will give the Dems the benefit of the doubt and go with the latter. 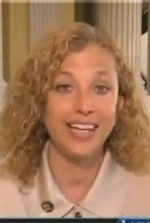 I am sure that Debbie Wasserman Schultz, the DNC’s version of Baghdad Bob, will insist that they are American warships, and there were no Russian ships. The DNC finally concocted an “apology“, blaming it on some “vendor error” using the opportunity to slam Romney and demonstrate Øbama’s “strong record on issues that impact those who have served our nation”. Of course, they couldn’t explain what a “vendor error” was, or how the American F-5’s flying overhead got there, since they aren’t used by the Russian Federation. Clearly, they couldn’t find any military personnel to use as consultants. Many Navy Times readers have cite the image’s erroneous broadcast as evidence that the Democratic Party was out of touch with veterans. [Added by Steve] This is a minor issue, that certainly will tick off sailors and Navy retirees. I almost guarantee some graphic designer plucked the image of a warship from iStockPhoto or something and used it for the slide. They got a bit creative and layered on a few fighter jets. That graphic design “professional” would not know the difference as to what is what. That said, if the same mistake was made by the RNC, the DNC and the press would be all over it. In other words, I don’t expect the head of the DNC and/or the leader of a political party to review every word and slide used at a convention or a campaign appearance. It’s a fun poke, but really does not tell us anything new or important about the DNC or their candidates. UPDATE: The Daily Caller has discovered that, based on the paint scheme and the flying formation, the seven jets in the backdrop were actually Turkish jets, old F-5’s sold to Turkey and other countries. Maybe they should stop using teenagers to cut and paste together their backdrops…. This is a measure of how much the Democrats hate the military! We have only moments to wait until our president denies and blames. He may control the words in the party’s platform but, he isn’t responsible for what the ‘crat convention presents. He can’t have it both ways. I will go you one better, Dims. This was a deliberate slap in the face to every patriotic American and a smug, snickering message to everyone that the progressive / Socialist / communists control the agenda. It is no accident that Russian ships were chosen. The intent is clear. The DNC was demonstrating to the world that they are admirers, worshipers of this latest iteration of totalitarianism. 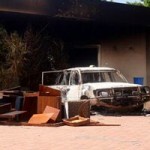 It’s only trivial because Romney or Bush didn’t do it…. So right. As you pointed out, if the Republicans did this there would be NO END of accusations, recriminations, blaming the RNC, blaming Bush, it was really a Romney operative . . . Polemics aside, I do so love to learn of the Dems being caught out. The bottom line is: they are ticking off the very people they are trying to impress. Given the responses to the article in the Navy Times, this ranks as an epic fail. I remember when Rick Perry had his brain cramp and forgot 1 of?the 3 agencies he would close?if elected?president, the 3 major networks led with that as their opening story, but they ignore this incompetent fiasco……. ?you are so correct that if this happened at the RNC, it would have been handled differently by our “objective” national press!?? At least they didn’t use a picture of a Klingon ship…. which might have been more appropriate for Lurch Kerry (who served in Vietnam). John Kerry is still suffering from his service as an officer in charge of a Swift Boat.? Kerry probably was having flash backs of eating K-rations, thinking the halazone tablets were dessert mints spending the majority of his duty over the side of boat emptying his innards.??? The DNC on the other hand, bought the poster on the whim from a 7-Eleven employee who had it hanging in their back room next to the walk in cooler. There’s always a simple explanation to everything. “….that the Democratic Party was out of touch with veterans.”? No, the Democrat (Never Democratic!) Party is out of touch with the planet Earth! Me thinks this was a Freudian slip. 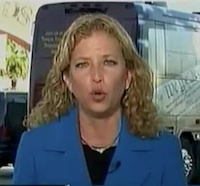 I love the Waterbug Schultz comparison?to Baghdad Bob!? Perfect. Agreed.? And to add, Hanoi Jane.